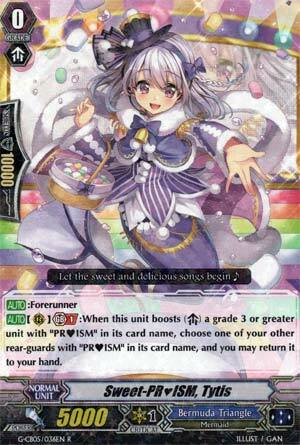 [AUTO]:Forerunner [AUTO](RC) Generation Break 1:When this unit boosts a grade 3 or greater unit with "PR♥ISM" in its card name, choose one of your other rear-guards with "PR♥ISM" in its card name, and you may return it to your hand. Free bounce. Why would you turn this starter down? Unless you don't run PRISM. Sunshine Clear, Sunshine Rosa, Emeral: they are just several combo pieces this thing can abuse. Well as far as PRISM starters go this isn't bad, gives another bounce at least. The thing is though, most PRISM bosses will either bounce units themselves or want the field empty BEFORE the swing so as to use combos like Labrador or Garnet. Not awful, but i'd prefer Sapphire or First Lesson Akari to start the advantage engine.